While I am completely comfortable with machine method and offered it for many years, I now specialize in the manual application of permanent cosmetics. Considered by many a 'kinder' more gentle method, perfectly suitable for the facial area. Think of this like a meet and greet! 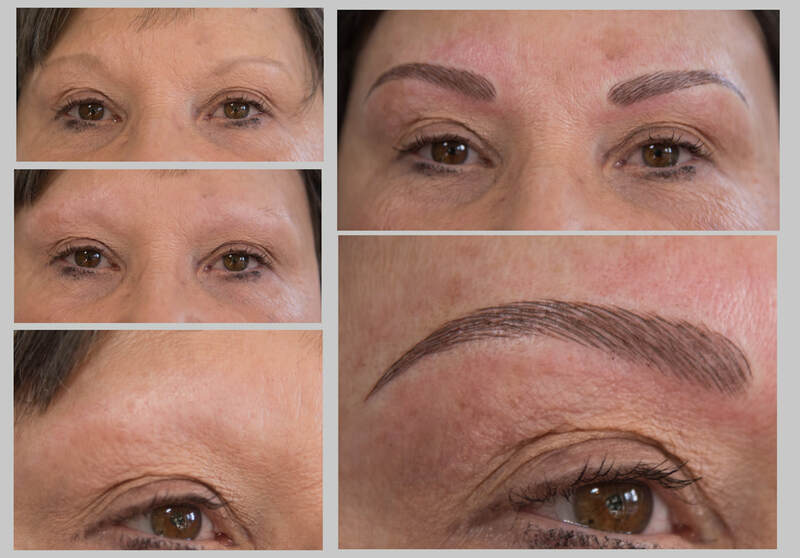 We meet, make sure everyone is on the same page with the desired results, go over any questions, draw a brow shape etc, discuss color and proceed with filling out a little paperwork so once your procedure appointment is scheduled, we can move straight to making you even more beautiful! For clients who do not live close, we can achieve a consultation over the phone. I may have you text or email a photo and will do a paypal invoice for the required deposit. Paramedical, camouflage type work is priced individually after (free) consultation. Pricing includes your first visit and one followup if needed before 90 days. Additional fee will be applied after 90 days. Touch-up for Full Lip Color/Shading....................add $100 to the above prices. Permanent makeup fades and softens over time. Some ashing or graying of the color is not unusual. Lighter colors tend to need more frequent touch ups overtime. The natural look of simulated hairstrokes soften and look best touched up about every 1-2 years. This will keep the shape defined and reinforce the color. Almost everyone will need one or two touchups to complete their procedure. Touchups are scheduled after the initial healing period of 4-8 weeks. These times vary depending on your age and the condition of your skin. How well permanent makeup does for you depends on your skin's condition, age, overall health, possibly medications you take and how well you follow the pre and aftercare instructions. You should refrain from the use of alcohol, aspirin, aspirin-containing medications, Ibuprofen, Vitamin E, Fish Oil products or any other blood thinning products for 7 days before and 3 days after any procedure. Also refrain from judgment-altering drugs for at least 24 hours prior to any procedure, that includes wine / alcohol. ( No medication should be discontinued without first consulting your physician). No tanning the week before or after too. If you have EVER had a fever blister, you must get and take a prescription medication for five days (Valtrex or similar). ​Start the prescription two days before, day of and two days after. Working on the lips can easily trigger an outbreak. Some medical conditions may not make you a good candidate for permanent makeup procedures. prone to forming keloid scars. If in doubt, contact your physician for a release before making an appointment.